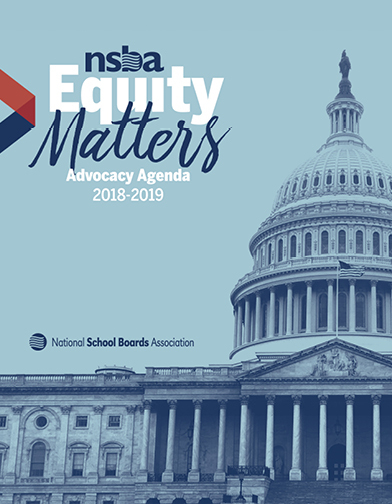 The National School Boards Association (NSBA), working with and through our state associations to represent more than 90,000 local school board members, advocates for equity and excellence in public education through school board governance. As a matter of priority, NSBA’s comprehensive advocacy and policy priorities reinforce a recent statement adopted by the association. We affirm in our actions that each student can, will, and shall learn. Educational equity is the intentional allocation of resources, instruction, and opportunities according to need. We recognize that based on factors including but not limited to disability, race, ethnicity, and socio-economic status, students are deprived of equitable educational opportunities. This requires that discriminatory practices, prejudices, and beliefs be identified and eradicated. To this end, NSBA believes the following legislative issues must be addressed in order for local districts to maximize educational opportunities that are available for every student to reach their greatest learning potential. In addition to the specific legislative issues outlined below, NSBA believes Congress must continue its oversight of the implementation of the Every Student Succeeds Act (ESSA) to ensure state and local flexibility in K-12 education. As states and districts work to implement the law, Congress must recognize the critical role of local school boards to lead the local district planning process and set policy and programs to best meet student learning needs. For over seven decades NSBA has advocated for equity and excellence in education. NSBA will continue to work with the 116th Congress on our legislative priorities to ensure that public schools and the 50 million students that attend them get the support they deserve. Please read more to learn about our legislative priorities for the 116th Congress.